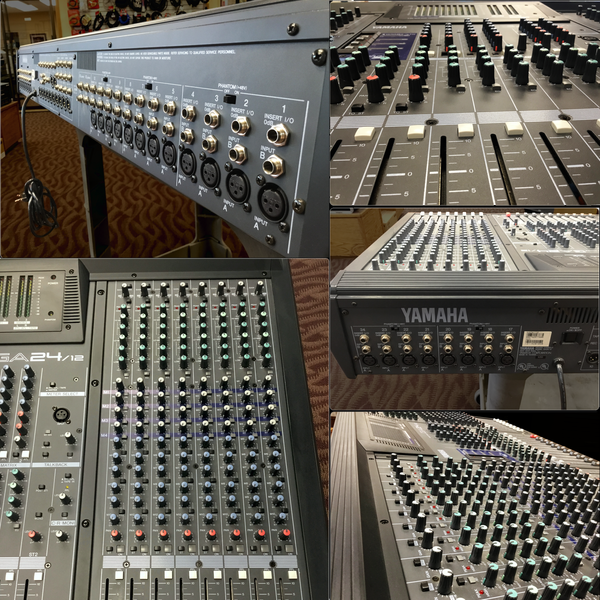 This mixer is in "Good" to "Very Good" aesthetic condition; unit passes standard bench tests, passing clean, uncolored & undistorted audio from each input to each output and routing through mix busses. Owner’s Manual available free online. These are solid, great-sounding boards that are durable, feature-rich and well-built; mature analog technology and knob-per-function usability make them particularly well-suited for education, house of worship, corporate, entertainment and other applications where multiple users with a wide range of skill sets can make full and immediate use of every function with little to no learning curve. 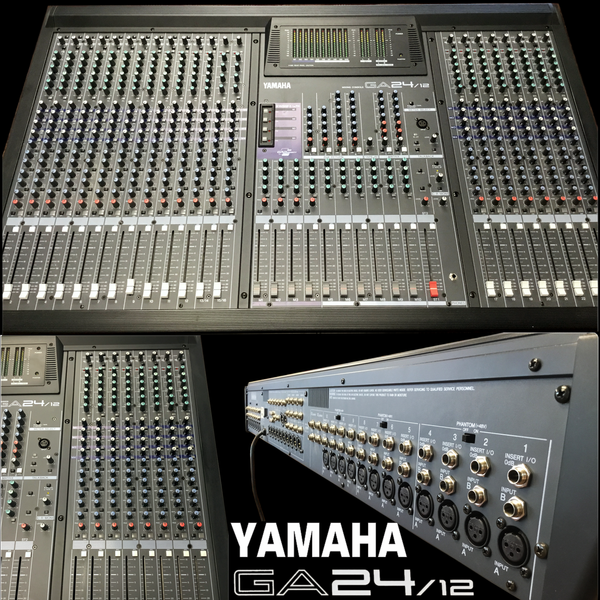 The GA24/12 provides 20 monaural and 2 stereo input modules in a compact, user-friendly knob-heavy analog desk. 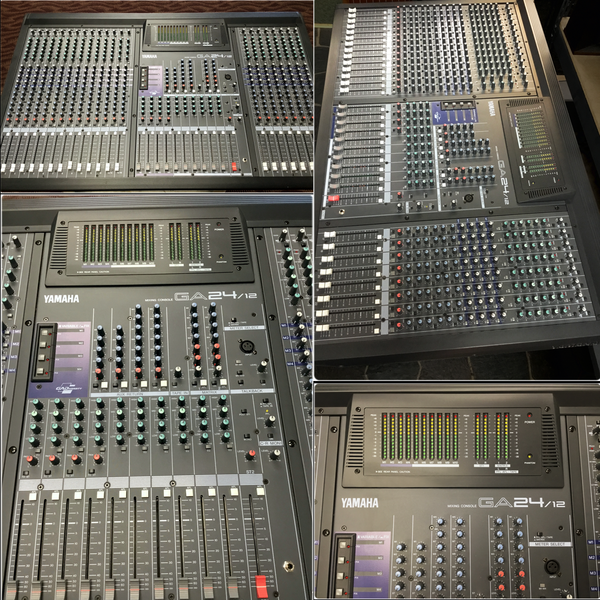 The Stereo Main outputs, 10 Mix Bus outputs, and two Matrix outputs support a wide range of applications; its 10 direct-access submixes and two Matrices make it well suited for FOH or Monitor applications in a variety of sound reinforcement settings. A separate ¼” balanced TRS Input B on each channel offers repro channel playback for recording applications as well. • Each monaural input channel features a -26 dB pad, HPF, phase switch, 4-band EQ (HI-MID and LO-MID frequencies are variable), and 100mm long full-stroke fader. • 48V Phantom power switching per group of four inputs. • Four stereo AUX returns and TAPE IN jacks are provided as standard. • The master section of the console is located in the center area of the unit, providing output channels for MIX buses 1–10, with EQs and 100 mm-long faders. • Each input channel and four stereo AUX returns include a PFL switch, and stereo bus, MIX buses 1–10, and Matrix 1–2 has an AFL switch, enabling you to monitor the input/output sources quickly. • Using the GA Diversity function enables you to set MIX buses 1–4 to Variable mode (Post Fader) or Fix mode (Pre Fader) individually. • Two independent matrices: MIX Buses 1–4 and the stereo bus controlled individually and output at MATRIX OUT 1–2 jacks. This routing can be used as a mix for the foldback, recording, or multi-zone speakers. • INSERT I/O jacks are provided for all monaural input channels, Stereo Mix Bus, and MIX Buses 1–4. • Talkback signals can be assigned to any of MIX Buses 1–4, MIX Buses 5–10, and the Stereo Mix Bus. • C-R monitor output switchable between PFL/ AFL or TAPE IN monitoring source.